Golden Eagle - Raptor Rehabilitation of Kentucky, Inc. 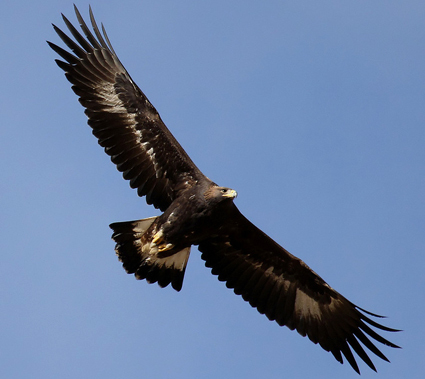 When viewing large dark colored birds soaring at altitude, it can be difficult to distinguish young Bald Eagles, Golden Eagles, and Turkey Vultures. In courtship, two birds circle high in the air, making shallow dives at each other. The nest is most often on a cliff ledge, or in a large tree, and may be used for many years. 1-3 eggs are laid in the large nest of sticks, and both parents take turns incubating them for 41-45 days. The male does the hunting at first, but as the young get larger, both parents must hunt to feed them. The first flight will be in 60-70 days. Northern birds are migratory. Because their common prey animals (mammals) don’t tend to ingest pesticides, Golden Eagles have escaped the harm sustained by fish-eating or bird-eating raptors from DDT and related chemicals. When these pesticides thinned the eggshells of many birds of prey, Golden Eagles’ shells retained normal thickness. Pesticide concentrations in their blood stayed below levels known to cause reproductive problems. The population in eastern Canada may migrate to Kentucky in the winter. Bernheim Forest and Arboretum in nearby Bullitt County, KY, is host to several young Golden Eagles each winter.